From time to time, you are bound to need to take your dog for a ride in the car, whether this is on a visit to the vet, a long walk in a new place, or a holiday. When they are in the car, you need to make sure that both you and he are safe, and one of the best ways of doing this is by investing in a dog car barrier. If you have even been through the distracting and dangerous experience of your pooch jumping into the front seat alongside you or on your lap, you will already know why this product can be useful. Whether you have already made the decision to buy one or you are still unsure, we have selected some of the best dog car barriers on the market. 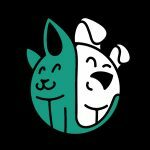 Hopefully, this will help to make your decision easier, and you can then choose the one which will be most useful to you and your canine companion. Designed to contain medium to large dogs, this steel construction is tough enough to stop your hound from leaping through to the front of the car. Bear in mind that it is not suitable for smaller dogs who can jump through the gaps, and your vehicle also needs to have adjustable headrest polls for the mounting to work properly. It is quick and easy to assemble without the need for any tools. If you need to move it from vehicle to vehicle, you can do so with relative ease. This wire mesh barrier is designed to keep all different sizes of pets from leaping into the front seat with you. Fully adjustable to accommodate a range of vehicles including SUVs, vans, and hatchbacks, this is a great restraint to hold back your overly excitable pet. The design is heavy-duty and durable enough to stand the test of time. Installation is straightforward enough to ensure that you can put it up straight away and switch it around from vehicle to vehicle as required. You will hardly notice that this see-through net barrier is there while you are driving, but you will notice that your pet is not leaping into the front with you! It can be raised up almost to the roof, while you can also add metal poles to hold the barrier in place against pushing. Extra strips at the bottom offer even more blockage. While some metal barriers can be a bit tricky to install, these ones have hooks and adjustable straps to make things straightforward. However, you need to check your vehicle to ensure that there are fixtures to which you can attach these before making a purchase. Designed to fit virtually any car, this pet barrier for your car is fully portable and adjustable as needed. 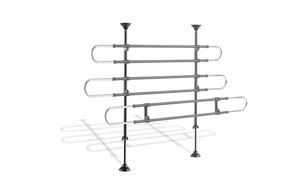 Unlike compressing barriers, this one is sturdier, as well as offering a high level of quality. And it also does not have to be drilled or clipped in like other common permanent barriers. To install this dog gate for your car, you just need to attach it to the headrest stems which are present in more auto systems. Make sure that the connections are tight, and you can help to discourage even the strongest of dogs from causing an issue. This pet barrier fits in-between your two front seats to provide extra protection against your dog jumping to the front of your vehicle. While it is a simple product, many pet owners have found it to be an effective one. You can install and remove it in a matter of seconds. 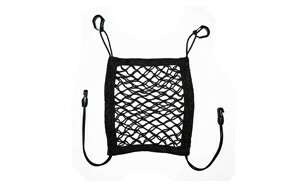 Another main advantage is that it is a multi-use product which also operates as a safety and storage net. Essentially, anything which has been knocking around in your car finally has a place to be put! A sturdy and durable option, this dog guard for your car is also fully adjustable and should fit comfortably inside the majority of SUVs and hatchbacks. Check the size listings and measure your car to ensure that it is going to fit properly. No tools are required when you want to install or take this car barrier out. The steel wire construction is high-quality, and you are also covered by a lifetime guarantee to give you added peace of mind. A scratch and tear resistant pet screen, the design of this SUV dog barrier all-mesh to ensure that the heating or cooling from your A/C can flow around the vehicle. To maintain the shape of the barriers, lightweight tubing runs around the outside. This helps to ensure that your furry friend doesn’t somehow wriggle through into the front! This 56-inch model is best-suited to full-size sedans, trucks and SUVs, but there is a 50” design if this one is too big. You can install this heavy-duty pet barrier without the need of any tools. Since it adjusts both vertically and horizontally, it should suit any vehicle and pet. The rubber-coated components are there to protect the interior of your vehicle, ensuring that the installation is rattle-free. Ultimately, this works better for larger dogs as the very small ones are more likely to find a way to wriggle through and get to the front seat alongside you! The flexible cords of this vehicle pet barrier are designed to fit around your car headrests, stopping your pet from getting up front with you. One of the great things about this product is that it is designed to work in all vehicles, both large and small. The vertical and horizontal installations are fit inside your car without the need for any adjustments. And since no tools are required, this is not going to take you a long time to install at all. Even the best-behaved dogs have a desire to be close to you, but a barrier will remove this temptation and ensure that this is not a serious issue. A good-quality dog car divider should have certain properties which ensures that it does its job properly. So, here are a few things that you need to consider before buying your own auto pet barrier. When selecting the right dog fence for your car, adjustability is a feature which should play a role. Firstly, it needs to fit whatever type of vehicle you have. And if you plan on buying a new car, it also needs to fit this one. Of you get a universal barrier, you don’t have to worry about buying an entirely new product. At the same time, you should also double check that you are buying a barrier which is not at risk of damaging your car on installation. If you don’t choose a universal barrier, it is an essential consideration to make sure that your barrier fits properly in your car and does the job that it was intended for. Not only does this come down to what type of car you own, but it is also a question of the size and breed of your hound too. Follow the guidelines carefully to ensure that you choose a pet gate for your car which does everything that you want it to. Both soft and hard barriers are available, and they each have their own individual set of pros and cons. Soft barriers are quick and easy to install. Generally, they feature a small rope construction which stops even the smallest of dogs from getting through. However, if you have a larger and stronger dog, you may find that a hard, heavy-duty barrier is your best option. These are usually meant to be installed on a more long-term basis, but they may not be suitable for smaller pups who are likely to be able to slip through the gaps. No matter which type of pet cargo barrier you choose, it is important to remember that putting your dog in the car is bound to heighten their feelings of anxiety and/or excitement. Scratching and chewing are natural reactions when your pup is trying to alleviate these feelings, so it is important that you select a barrier which is durable enough to withstand this until you can get them used to riding in the car with it. Now, think about where your dog will be sitting when they are in the car with you. If it is the backseat, a relatively simple barrier which stops your dog from leaping into the front with you may be enough. If you have a large SUV or van, you may want to consider a barrier which runs across the entirety of your backseat to make sure that they have no opportunities to leap forward to the front. Again, you need to check your vehicle and measure it if you feel at all unsure. One of the main issues with car barriers is that they are likely to reduce your visibility in some way. The mesh screens mean that you don’t have a clear view through to the back, while the metal ones mean that your view is more obscured than normal. Ultimately, it is worth considering which variety you are most comfortable with. After all, you want to ensure that your driving experience is disrupted as minimally as possible. Obviously, if the car barrier is easy to install, this helps to make your life a little bit more straightforward as well. Since there will be plenty of times when you are not traveling with your furry friend, you may want to take it up and down. Alternatively, you may have multiple vehicles and want to move it around from one to another. If it is foldable and goes into storage easily, this is an added bonus. This way, it will not take up more space in your home than in needs to. However, you need to weigh up the ease of installation issue against the durability factor. It is all well and good it being easy to put up and take down, but it still needs to do its primary job effectively. As well as the main feature of stopping your dog from getting up front with you, some of the dog car barriers have some extra features which may encourage you to make your mind up. For example, some have an additional storage pocket where you can keep loose objects which had otherwise been taking up space in your car. Otherwise, the net may have a dual function as a storage device as well as a barrier. While these extra features may not make your mind up on their own, they are always going to be a bonus. Letting your dog move unrestricted while you are in the car poses a danger to both you and them. And it is also one which is easily avoidable by investing in a product like a car barrier. Let’s look at a few of the specific dangers in a little more detail. The most obvious risk caused by an unrestrained pet in your car is that you are going to get distracted. If your dog can roam freely around the car, there is every chance that they will want to clamber forward into the front seat alongside you. Even worse, they could end up in your lap, or down where the brake and gas pedals are located! And when you are trying to return them to the back of the car, those precious seconds are time when you are not focused on the road. Ultimately, this is going to increase your odds of getting into an accident which was otherwise avoidable. A pet barrier for cars is one possible restraint, but you could also look into getting a harness, belt, car seat or something else similar which will hold back your dog. Even if you don’t get into an accident, there are occasions when you are driving and need to make a sudden stop. If your pet is not properly restrained, they could end up flying into the front of the car, or even hitting the dashboard or windshield. Not only could this be hazardous to your furry friend, it could also result in an injury to you and/or damage to your vehicle. Ultimately, it is worthwhile restraining your dog to make sure they stay in place. Carsickness is an issue which can strike dogs both large and small. Often, this can be caused by anxiety, but problems can also occur if you drive too aggressively. When you are first taking your pet out on trips, you should try taking some shorter journeys to get them used to riding in the car. Limit the amount of food which you give them in the hours before you get out on the road. Also, you should make sure to take regular bathroom and stretching brakes if you are heading out on a long car journey. In general, you should try to drive conservatively without too much speeding or sudden stopping. While there are no guarantees when it comes to carsick pets, a car restraint will confine them to the backseat where you can put down plastic covers to protect against vomit etc. Depending on where you are driving, it may be a legal requirement that you keep your dog restrained in one way or another. The dangers of driving with an unrestrained pet are becoming more and more clear, and more and more states are reacting to this by putting legislation in place. So, as well as all the potential dangers that you have listed above, you don’t want to risk getting into any legal trouble as well. Most car barriers should be relatively easy to install, but you need to make sure that you know what you are doing beforehand. The installation methods vary depending on which sort of dog car barrier you choose. The simplest ones are designed to loop over your car headrests and may attach to fittings which are already present in the car. As for the sturdier metal installations, they usually have adjustable vertical and horizontal poles which you can stretch out to fit the size of your vehicle. Some of these are designed to fit all vehicles, while others are more specific, so it is important that you know what you are buying beforehand. Most dog car dividers are easy enough to install in a matter of minutes, but you should always ensure that you know what you are doing beforehand, and that the product works in your specific vehicle. Q: What is a pet car protector and barrier? A pet car protector and barrier is a blocking device which restricts your dog’s movement while they are in the car. Essentially, it is a product which is designed to protect the safety of everyone in the car by stopping your dog from jumping into the front seat and distracting the driver. It may come in a hammock-style which restricts them to a single area. You install it by securing it to the headrests of the front and backseats. Some of them will also protect the doors from your furry friend, which will stop them from rolling down the windows or doing something equally dangerous. Alternatively, there are heavy-duty barriers, which take longer to install, but are designed to stay in place for longer. Mesh barriers are for smaller dogs to stop them squeezing their way through the gaps. The other main option is to get a universal fit barrier which works with a vide variety of vehicles. Whichever variety you choose, it should perform the same primary task of preventing your dog from getting into the front seat of the car and causing a distraction. Most car barriers readily available are of the universal fit variety, which means that they are designed to work in a vast array of different vehicles. Once you get the barrier inside your car, there should be parts which you can adjust and tighten as necessary to ensure a secure fit. Even so, it is still important that you take the measurements to ensure that you are buying a barrier which will comfortably fit inside your car. Although they are not as common, some pet barriers will only work in certain vehicles. Some people prefer these as they provide a more secure fit, but you need to be more careful in your choice. If you want to be especially certain of vehicle compatibility, you could even get in touch with the manufacturer beforehand. Q: Are vehicle barriers safe? One of the major advantages of dog car barriers is that they prevent various safety issues commonly associated with having your dog in the car with you. Barriers make it much more difficult or impossible for your dog to suddenly leap onto your lap while you are operating your vehicle. However, there are a couple of additional safety precautions which are worth taking. First of all, when you install it, you should ensure that it does not badly affect your visibility levels. Check all of your mirrors to ensure that it is not obstructing your view too much. While a solid panel may be effective at keeping your dog contained, it may not be the safest option when it comes to visibility in your vehicle. 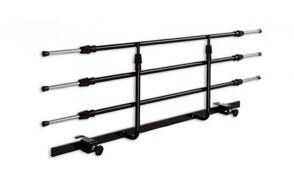 Our top pick is this adjustable car barrier from Walky Guard which is made from high-quality, powder-coated steel. The barriers are far enough apart to stop medium and larger pets from clambering into the front seat with you. When you want to put it in your car, you can do so easily. Removing the guard is also straightforward by just loosening the knobs. Essentially, this is the kind of product that does the job you expect from it, keeping you and your furry friend safer in the car.